Growing awareness and numerous benefits of telematics, advancement in smartphones, high speed internet connectivity, and developed GPS receiver have changed the telematics business rapidly. Moreover, rising awareness about driver’s safety and growing influence of safety regulations imposed by various government organizations in the European Union, Russia, and Brazil have made telematics an essential component for vehicles. The factors such as reduction in the cost of connectivity and increasing market penetration of connected devices such as smartphones, and tablets are contributing to the burgeoning demand for connected cars. The automotive telematics market by volume is estimated to witness a growth at a CAGR of 19% over the period of 2016 to 2022. The report is a compilation of various segmentations including market breakdown by connectivity type, vehicle type, distribution channel, and different geographical areas. The report details the market analysis and forecast with respect to its various connectivity types such as embedded, tethered, and integrated. While highlighting the key driving and restraining forces for this market, the report also provides a detailed study of the different vehicles that are analyzed which includes passenger cars (compact, mid-size, and luxury) and commercial vehicles (LCV, heavy trucks, and heavy buses). Segmentation of market, by the distribution channel (OEM and Aftermarket) is also included in the report. It also details the leading players involved in the industry and provides an overview of future trends and evolution of telematics. • What is the global automotive telematics market size in terms of revenue and volume from 2016-2021? • What is the dominant type of connectivity used in automotive telematics? • What is the revenue generated by the different connectivity systems, vehicle type, and distribution channel of automotive telematics market? • Which vehicle type will lead by volume in the global automotive telematics market by the end of the forecast period? • What is the revenue generated by the different distribution channelin the global automotive telematicsmarket in the period 2016-2021? • What are the major factors challenging the growth of the global automotive telematics market? • Which region will lead the global automotive telematics market by the end of the forecast period? Various services such as information & navigation, safety & security, entertainment, and remote diagnostics have also been analyzed. The report also highlights the major services and product offerings by different OEMs with major focus on the supply chain analysis. The report includes an exhaustive analysis of the geographical split into NAFTA (the U.S, Canada, Mexico), Europe (Germany, the U.K, France, Italy, Rest of Europe), Asia-Pacific (China, Japan, South Korea, India, and Rest of APAC), South America, and Middle East & Africa. Each geographical region analysis details the individual push and pull forces in addition to the key players from that particular region. The report examines the role of the leading market players involved in the industry. The Company Profiles section includes highlights of significant information about the key companies involved along with their financial positions, key strategies & developmental activities of recent years (2014-2017). Some of the key players in the industry are Robert Bosch GmbH (Germany), Continental AG (Germany), AT&T Inc.(the U.S), Verizon Communications Inc. (the U.S), TomTom NV (the Netherlands), Teletrac Navman (the U.K), Mix Telematics Ltd (South Africa), Octo Telematics SpA (the U.K), Delphi Automotive PLC (the U.K), Airbiquity Inc. (the U.S), and Wireless Car AB (Sweden). The automotive industry has been undergoing dynamic changes since the past few years due to various factors such as declining fuel prices, low industry growth rate, emergence of electric and hybrid electric vehicles, improvement in automotive credit availability, aging vehicle fleet, and last but not the least, the emergence of disruptive trends such as car sharing, and ride hailing services, globally. The stakeholders in the automotive ecosystem are gearing up for the highly competitive nature of the market by gradually developing technologically enhanced products and solutions to gain market share in the already established automotive market. The automotive telematics system is one such technological innovation which is gaining immense popularity among the consumers owing to the benefits it brings in terms of entertainment and information content, cost savings, safety and security, among others. The growing importance of connectivity and safety, advancement in smartphone technology, and high-speed internet connectivity has largely transformed the telematics industry. The Original Equipment Manufacturers (OEMs) are increasingly incorporating advanced telematics services in all the vehicle categories owing to the system’s multiple benefits, thereby driving the adoption of automotive telematics. The telematics technology has the ability to convert vehicles into information stations, eventually making the lives of the users more convenient, and safe. A telematics system consists of hardware and software which incorporate some form of cellular communication, allowing the transfer of data between the car and its surroundings. The report defines and estimates the market size and future growth potential of automotive telematics market in terms of both value and volume. The global automotive telematics market is estimated to reach $17 billion by 2021. The market is driven by number of factors such as increasing safety and security regulations, rising disposable income, lower cost of connectivity, and increased market penetration rate of smart phones. The rising hacking and privacy concerns, and low awareness regarding telematics are some of the factors which are hampering the overall market growth. However, the growing demand for connected cars, increased adoption of telematics in the insurance industry, and the growth of the emerging economies such as India, and China are some of the factors which are expected to fuel the market growth in the forecast period. Telematics is a form of communication technology that can be provided either through an integrated communication module or a smartphone, and hence, the market has been classified into embedded, tethered, and integrated, based on connectivity. Embedded connectivity dominated the global automotive telematics market and accounted for 48.2% market share in 2016. Embedded telematics is a fit for all the services such as remote diagnostics, safety and security, navigation, among others, whereas, tethered and integrated connectivity are not applicable for safety and security services. The passenger cars segment dominated the global automotive telematics market in 2016. 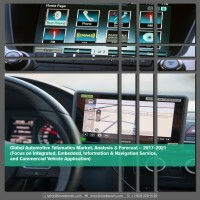 The stringent governmental regulations, high production volume of passenger cars, and growing demand for connectivity solutions and infotainment features in passenger vehicles will be the major factors driving the market growth. The growing demand for fleet management services and increasing adoption of telematics technology in the insurance industry are also expected to play major roles in the growth of the telematics market for passenger cars and commercial vehicle. The OEM channel segment currently accounts for the highest share of the total market share in the global automotive telematics market. The market for OEM is driven by significant factors such as reliability standards, stringent governmental regulations, and increasing partnerships with the service providers for better product offerings such as 4G LTE internet connectivity. This report also covers the global automotive telematics market, by geography and provides the shipments of the key regions which include North America, Europe, and Asia-Pacific (APAC), and ROW. APAC acquires the largest market share in the global automotive telematics market which is attributed to the robust growth of the telematics market in the South Asian countries comprising some of the leading automotive producers in the world. APAC is home to 4 of the top 10 automotive manufacturers in the world, and currently dominates the telematics value chain. A well-established automotive industry, increasing disposable income, and growing awareness about telematics are some of the factors contributing to the market growth in APAC. Some of the key players in the industry are Robert Bosch GmbH (Germany), Continental AG (Germany), AT&T Inc. (the U.S), Verizon Communications Inc. (the U.S), TomTom NV (the Netherlands), Teletrac Navman (the U.K), Mix Telematics Ltd (South Africa), Octo Telematics SpA (the U.K), Delphi Automotive PLC (the U.K), Airbiquity Inc. (the U.S), and Wireless Car AB (Sweden). These companies are aiming for an increased number of product launches and collaborations to expand their operations and prevent new companies from becoming potential future competitors.